Use the Mayo-Hegar Delicate Perma Sharp Needle Holder to grasp and guide the needle when suturing. The slender shape of needle holders allows them to reach far into interproximal areas, and prevent needle rotation or suture slipping. Most needle holders feature a multiposition ratchet that provides controlled grip pressure and smooth grip release. Perma Sharp needle holders feature tungsten carbide inserts with a ground pyramidical profile to ensure a firm, positive needle grip. 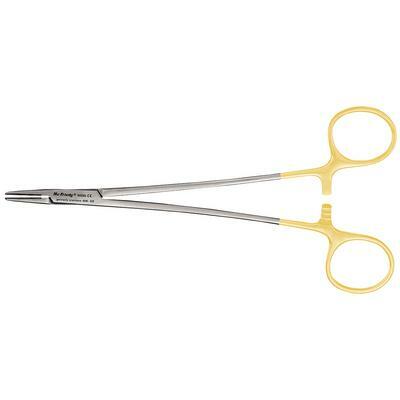 Needle Holder – Mayo-Hegar Delicate Perma Sharp® 18 cm/7"